While patchy dark brown spots on your face may seem frightening, chances are more than likely that these spots are the result of a skin condition called Melasma. While may not have heard of Melasma before, the condition is quite common; it is known to affect many women with fair to medium skin tones. If you’re wondering exactly what Melasma is and how can you treat its accompanying dark spots, read on! Melasma is brought on by the combination of a few different scenarios. First, it relates to the imbalance of two hormones: progesterone and estrogen. For this reason, Melasma is quite common for women whose bodies are going through hormonal changes (e.g., women taking birth control, women who become pregnant, women using hormone replacement therapy during menopause). The second condition is needed to trigger Melasma is exposure to the sun. In fact, it is more common in women who live in warm, sunny climates, spend a lot of time outside during the summer, or aren’t good about applying SPF. On the other hand, those who avoid the sun, live in cloudy climates or are adamant about applying SPF are less likely to experience the skin condition. Since the first set of conditions that cause Melasma all trigger hormone changes, it is also worth mentioning that those who experience long-term stress, hereditary hormone imbalances, thyroid dysfunctions, and even side effects from medications can all lead to hormonal changes and trigger the skin condition. The one single symptom associated with Melasma is a change in the color of the skin on the face. As with many other skin disorders, the discoloration appears in a brown tone and can show up on the cheeks, nose, forehead, and upper lip area. While this may sound like run-of-the-mill dark sports that appear due to age, there is one visible symptom that sets Melasma apart. The brown spots that appear due to Melasma tend to be symmetrical, that is, they form on both sides of the face. The good news for those of you experiencing Melasma is that there are both medical and at-home treatment options. One thing to note, however, is the recommendation that those who are on hormone treatments stop, and those who are pregnant wait until after they’ve given birth—in these two situations, it is likely that the Melasma will subside on its own. 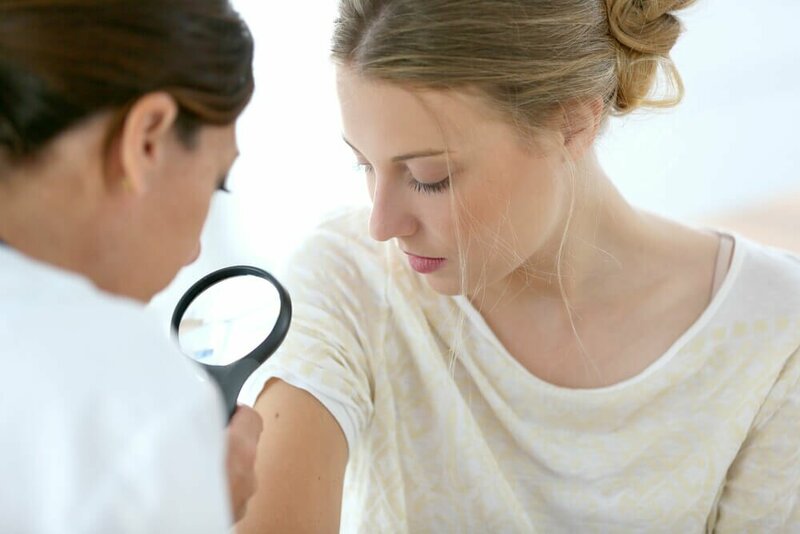 Now, if this is not the case for you, there are a few steps that a dermatologist will recommend depending on the severity of the condition and the state of your skin. Often times women find relief with topical treatments that contain a combination of ingredients kojic acid and azelaic acid, or hydroquinone and tretinoin. Those who are looking for at-home treatments may find modest relief in typical over the counter dark sport correction products, as the goal is the same: to lighten up the darker pigments. Whether you’re currently experiencing Melasma or have a family member who’s experienced it (some research shows that it may be hereditary), it’s important to remember to always use SPF—without sun exposure, Melasma can’t occur!